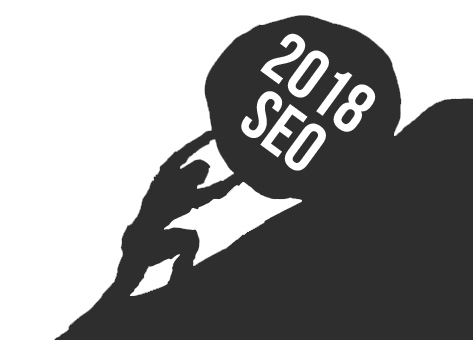 As 2018 fast approaches, SEOs are taking a step back and regarding the past year’s search trends with the shrewd eyes of weathered war heroes. They’ve seen it all, from the clumsy first steps of the Google Dance to the Great Rankings Massacre of 2013, to the mysterious rise of artificial intelligence in Google’s algorithm. SEOs have been on the front lines of search since the search bar was first forged in the fires of the dot-com boom. SEO journalist and commentator Danny Sullivan retired from journalism in 2017. SEO heavyweight and Moz co-founder Rand Fishkin left Moz operations for an advisory role. Longtime Search Engine Land writer left the organization in July. Increasingly, SEOs are closing up shop, or pivoting into other industries. The consensus among SEOs is that search algorithms are getting more intelligent, and the old-school optimization methods just don’t cut the mustard anymore. As search engines get more sophisticated, digital marketers and webmasters need to step up. Failure to adapt and innovate means extinction. SEO has always been a fast-changing and unforgiving industry. The last twenty years of algorithm updates have proven that webmasters that rest on their laurels are forgotten by time. 2018 will be a time of reckoning for webmasters and SEOs alike, and the sophistication of search will lay waste to the lazy, the sketchy, and the old-fashioned. Takeaways: Shortcuts, swindles, and “SEO hacks” are becoming a thing of the past. Work smarter, harder, and adapt to the increasingly-intelligent algorithm changes, or get out of the business. RankBrain is huge, and getting huger. For those who scoff at the influence of artificial intelligence in search, Google has stated RankBrain is their third most important ranking factor. RankBrain is a machine-learning component of Google’s algorithm that was introduced in late 2015, as part of the Hummingbird update. It interprets search queries in a much more adaptive, organic way, and interprets related search terms. Suddenly, dwell time is a very big deal. If we think about the purest function of Google, it is connecting users with what they are looking for. The last few years have shown us Google is getting better at knowing what we are looking for, even before we do. “Searcher Intent” is becoming more and more important in search. Artificial intelligence is interpreting what the searcher is up to, and (more specifically) what part of their buyer’s journey they are in. RankBrain knows what searchers want, and presents them with the best user experience possible. Thin content, slow-loading sites, and spammy, ad-infested garbage is the last thing RankBrain wants searchers to see. “Searcher task accomplishment” is sort of a big deal. More and more search queries start with How to… or _______ recipe or What to do when ______. RankBrain considers searcher behavior, and determines who completes a task on what site, and who gives up after visiting certain sites. Dwell time, click-through rate, reviews, social shares, and many other factors culminate in a site’s score. As you can imagine, SEOs that rely on simple tricks to rank will go the way of all flesh. RankBrain is a multi-dimensional, sophisticated, and actively learning juggernaut that will never die. All hail, Rankbrain! Takeaways: Google’s algorithm is getting smarter. User experience, search intent, task accomplishment, and many more factors contribute to RankBrain, and it’s getting nearly impossible to trick. More than half of searches are done on mobile devices. Among those, 20% are voice searches. Digital assistants like Siri, Alexa, Home, and Cortana have gotten more mainstream, and many of their irritating bugs have been (mercifully) worked out. The experts agree: voice search will see a surge in 2018. With some exceptions, people talk differently from how they type. People talk to the digital assistant in a different way than they talk to their friends. If you’re anything like this article’s humble author, you talk to your digital assistant the way you’d talk to a very old, very drunk relative. Voice search has already made an enormous impact on local businesses, since a mobile voice searcher is three times more likely to have local results in mind. As people ask their mobile phones more questions, task accomplishment and search intent ranking factors have adapted to voice-mobile search. Google’s mobile index has been teased for years. Experts are saying 2018 is the year it will be launched, but not a lot of firm information has materialized, and it may be pushed back a few quarters. Responsive sites will be prepared for the mobile index, while desktop-only sites will be ignored by the mobile index. Non-responsive sites getting penalized? That’s been happening for years. However, Webmasters and SEOs should know about the increasingly stark penalties for sites ill-equipped for mobile and voice, or they will be hurting. Takeaways: Advancement in voice search and Google’s mobile indexing will change search across devices. These changes could be opportunities to edge out competitors, or an omen of slumping rankings. Keeping voice search and mobile responsiveness in mind will empower webmasters and digital marketers in 2018. There was a time when the #1 position in organic ranking was the Holy Grail. It is, in fact, still a very big deal. Take a look at the Google Search Engine Results Page (SERP), though. In most queries, especially related to goods and services, organic results are below paid ads, local packs, and even a map. As you can imagine, after scrolling down to see the #1 organic result, organic click-through rate is down 37% since 2015. The space above the fold is getting all of that precious traffic. Rockstar rankings in organic just aren’t enough anymore, according to SEOs. The new space to fight over is paid ads, local pack, and the “Featured” zone. To get above the organic rankings into the snippet zone, have a common question in mind. Address the question in your content, answer the question as simply as possible, add an in-depth analysis beyond the simple answer, and optimize your content. Is this method a golden ticket to the snippet zone? Of course not. There are no golden tickets in SEO. It will, however, make your content a contender for the snippet spot, even if your site’s authority is lower than a competitor’s. Takeaways: Google is continuing to condense results into palatable little nuggets of content, as opposed to exhausting slogs through long-form articles. As more users are consuming search with an instant gratification mindset, the 0 position is the smart money. Content is Experienced, and the Experience is Important. If I had a nickel for every time I heard the cliche, “content is king,” I’d have enough nickels to fill a pillowcase and gleefully bludgeon the next person to say it. And probably like 35 bucks. Needless to say, it’s an overused expression, and it’s not fully understood. The saying has truth to it, but that doesn’t stop it from boiling my blood. In 2018, content will be a much more immersive experience. Scroll through your favorite social media feed, and what do you see? The answer is videos. Eye-popping visuals. Interactive media. Memes. Surveys. Occasionally, you see content so intense, your heart surges with a dose of adrenaline. If you think 300-word blogs written by an underpaid stooge at a content farm is going to move the needle in the coming years, you’re going to be very unhappy. RankBrain is surfacing content with great user experience (UX), and that isn’t going to change. SEO is becoming more user-focused, and truly original, meaningful content that actually resonates with users will be favored over dry, formulaic content. Leaders in SEO agree that video is a huge priority. YouTube is the #2 most popular search engine in the world. If video isn’t already the world’s most preferred way to consume content, it definitely will be in 2018. If you haven’t incorporated video into your marketing strategy, it’s time to start. If you’ve even casually followed search developments in the past five years, these predictions for 2018 should come as no surprise. Content quality, user experience, voice search, the importance of responsive design, paid ads, elusive algorithm changes… Google is angling towards making the user’s experience easier and more delightful, while frustrating SEO professionals every step of the way. • Stop trying to bamboozle Google. • Focus on metrics like dwell time, click-through rate, and task completion to appease RankBrain. • Test and optimize your site and content for voice search. • Change the way you think about organic rankings, and consider paid media. • If your site isn’t mobile-responsive, Google hates you. • User Experience (UX) isn’t just a buzzword. Put the user first, and do everything you can to get more immersion into your web content. • If video isn’t a part of your marketing efforts, you’re missing out on tons of traffic. • Perform regular content audits to make sure your material is relevant and up-to-date. If your website were a car, a content audit would be an oil change. • Try to answer common questions with your content to compete for featured snippet spots. • Artificial intelligence means a more sophisticated search, and a trial-by-fire for the SEO industry. Adapt, or change careers. • Site security has a bigger impact than you might think. An unsecured site gets less traffic, lower dwell times, a higher bounce rate, and peripheral penalties. • Users are on mobile devices, using their phones to complete tasks. Help them complete tasks, and Google will be most pleased. • Ranking #1 doesn’t get the same results it used to. Diversify your web presence to get more results.